The Outside Plant Design (FTTx-OSP Design) certification program is sponsored and operated by the Fiber Broadband Association. Certification at the FTTx-OSP Design level indicates a professional level of technical competence in FTTH outside plant design for both FTTH and FTTB installations. Certification consists of demonstrating knowledge and familiarity with FTTH Passive Optical Network (PON) and Active Ethernet (AE) architectures, Outside Plant design, and deployment technologies. Certification is not directed at specific vendor’s products or equipment, rather to certify professional competencies. This preparatory training course is geared toward Network design, operation and administration personnel, and is run by The Light Brigade. The course level is intermediate to expert. This class requires knowledge of fiber optic theory and terminology, as well as field experience, equivalent formal training such as the FTTx OSP Design course. A three-day FTTx-OSP Design course has been developed with 16 hours of classroom lecture and 8 hours of hands-on design exercises to teach attendees to apply critical issues such as customer take rate and density to outside plant design. This course will prepare industry professionals to take the Association's FTTx-OSP Design examination. The goal of the FTTx-OSP Design program covers FTTH network field configurations, design benchmarks, and installation parameters for high-rise buildings, campus style apartments, single family urban residential areas, and rural areas for active Ethernet and PON systems. The “hands-on” portion of the course allows attendees to create their own FTTx network designs in classroom break-out sessions, applying the learned objectives to distributed split, centralized split, home run, and point-to-point systems. For more information and a class schedule - CLICK HERE. The training course and the examination process are two separate events. It is possible for those who feel they already know the material and wish to only pursue the certification designation to only take the FTTx-OSP Design exam. Certification indicates a professional level of technical competence in FTTx-OSP Design. The certification fee is $150 for a 3-year period and can be purchased by clicking the link below. Once you are on the exam purchase page, click the grey box at the bottom of the page. You will receive a link for the test software, along with a username and password, usually within 24 hours. You can take the test at any time, but once you begin, you will have 90 minutes to complete it. There are two parts to the exam, and once you hit the SUBMIT button on a given page of answers, you cannot return to that page. Correct answers receive 1 point, incorrect answers receive 0 point, and skipped questions receive -1 points. If you pass with a score of 80% or greater, you will receive a certificate via email good for three years stating that you are an Fiber Broadband Association FTTx OSP Accredited Professional. You will also be listed on our website as a Certified Fiber to the Home Council FTTx OSP Professional. If you do not pass, you will receive a new username and password to use for a free re-take. The re-take must be taken within two weeks after receipt of the username. Click here to access a list of those who successfully passed the examination and are certified as FTTx OSP Professionals.This database is maintained by the Fiber Broadband Association, for confirmation for prospective employers and others. At the end of the 3-year period, if you wish to renew your certification, please email certification@fiberbroadband.org with your name and company name. You will then be enabled to purchase a renewal exam for $75. 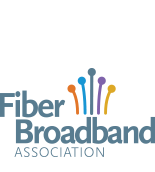 Place a Fiber Broadband logo on your site and promo to show you are a member! We will post on our site and newsletter.